"Being in a firefight is way different than being in a wildland fire, but both are mentally taxing," one member said. 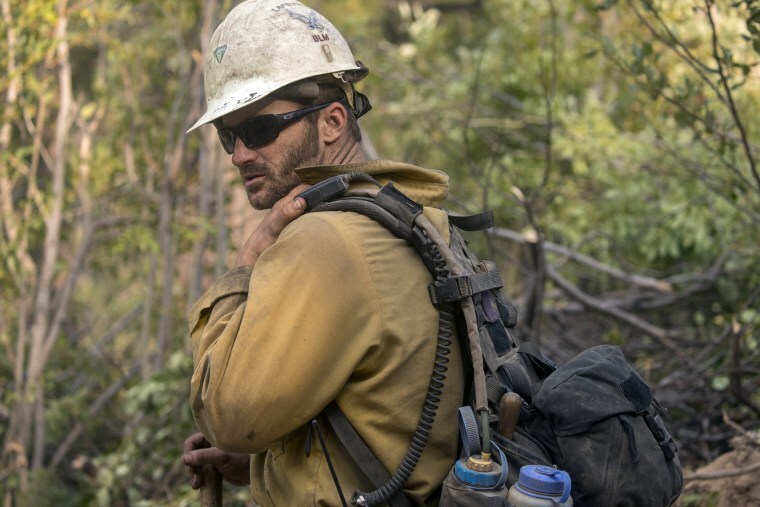 SALEM, Ore. — After being in firefights in Afghanistan and Iraq, members of one of America's newest elite wildfire crews are tasked with fighting fires in rugged country back home. On the U.S. Bureau of Land Management's only hotshot crew focused on recruiting veterans, members have traded assault rifles and other weapons of war for chain saws and shovels. But, like in the military, they have camaraderie, structure and chain of command. And the occasional adrenaline rush. "Being in a firefight is way different than being in a wildland fire, but both are mentally taxing," said Chris Schott, who served two tours in Afghanistan with the Army's 7th Special Forces Group. "In a wildland fire, no one's shooting at you, but conditions can go favorable to unfavorable very quickly." The Lakeview Veterans Interagency Hotshot Crew, based in Klamath Falls, Oregon, received its hotshot certification after rigorous training and testing, the Bureau of Land Management announced last week. It's now among 112 elite U.S. wildland firefighting teams and the only targeting veterans for recruitment, the agency said. Crew superintendent Michael McGirr said he and other managers took then-President Barack Obama's initiative to hire veterans to heart. The crew is on leave and hasn't been battling the recent deadly wildfires in California. Schott, the Army veteran, said the crew felt they had the potential to achieve elite hotshot status after fighting fires in 2015, including one in Oregon's Crater Lake National Park that they almost had contained when winds picked up and changed direction, pushing the flames behind them. Bad air from California's Camp Fire makes people sick, but for how long? Boles lost a close friend a week after he left Iraq. That was the biggest contributor to post-traumatic stress disorder that hit him later, he said, describing it as "a lot of survivor's guilt." The veterans have each other's backs when PTSD issues arise, acting as a support group. He said the men attaining hotshot status "demonstrates the exemplary quality and performance ingrained in this crew."